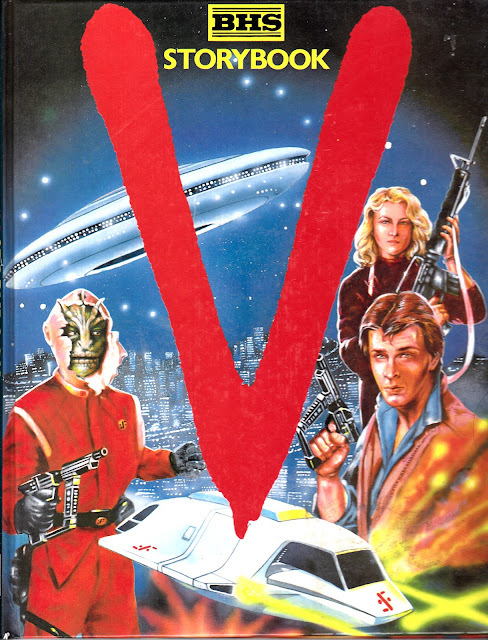 THE V STORYBOOK was an A4 one-off book, which looked pretty much identical to a British hardback annual, published (to coincide with the weekly series) back in 1985. It was sold exclusively through branches of the BHS (British Home Stores for the old skool) although it doesn't seem to be a particularly rare piece of merchandise with copies often turning up. The contents were firmly pitched at kids, matching the tone of the ill-fated weekly series but somewhat at odds with ITV's decision to schedule the franchise-killer in late night slots. The (uncredited) stories and art are pretty crude and aren't going to hold the attention of an adult for more than a moment... but it's still something cool to own. great post! is there any chance of having scans of this whole book? ?